This special formula is comprised of Magnesium and Potassium complexes formed from L-Aspartic Acid. Chelates of these elements have been formulated with Taurine to help support healthy heart, muscle and nerve functions. Taurine is an amino acid which can function as a neurotransmitter and neuromodulator. It serves as a potent synergist to these important minerals. This formula is great for muscle cramps. Magnesium potassium aspartate is the fusion of the minerals magnesium and postassium with aspartate, which is a nonessential amino acids that helps the body break down proteins for energy. Magnesium potassium aspartate holds benefits in the field of sports nutrition as well as the individual benefits of magnesium and potassium. Magnesium potassium aspartate is beneficial in long term sports endeavors such as endurance running. This supplement shows the greatest benefit for participants who are untrained or not in peak physical condition. According to MineralsInc.com, untrained runners experienced up to 50 percent longer times to exhaustion when they were on a regimen of magnesium potassium aspartate. These participants who experienced greater endurance were taking 7 g to 13 g of the supplement. 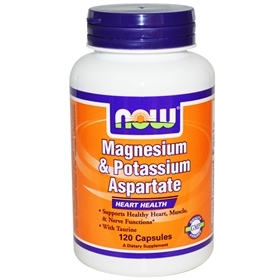 Magnesium potassium aspartate contains potassium, which has several benefits. According to the U.S. National Library of Medicine, potassium is an electrolyte that is involved in electrical and cellular body functions. Potassium helps to regulate your acid and base levels and is essential for regular electrical cardiovascular activity. Potassium assists in protein synthesis and carbohydrate metabolism. Potassium is also necessary for the development of muscle tissue and normal body growth. Suggested Use: As a dietary supplement, take 2 capsules, 1-2 times daily with or between meals. Free of: sugar, salt, gluten, yeast, corn, soy, wheat, milk.